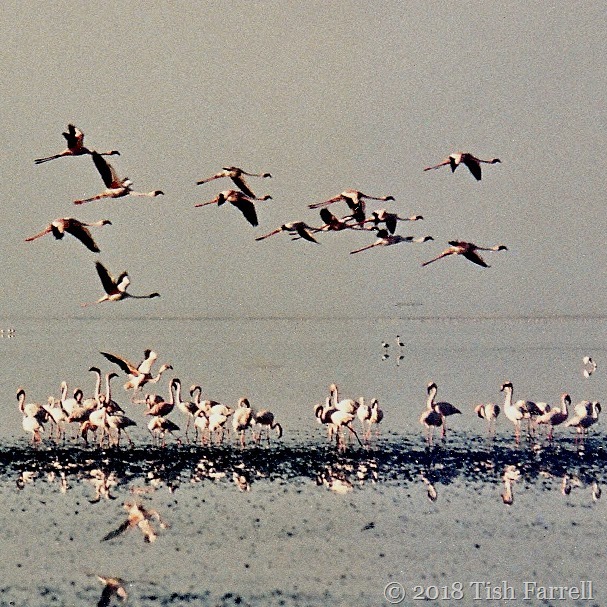 It looks like a mirage, I know – not helped by aging photo/collapsing scanner syndrome. But even when I was taking it, it was hard to believe I was there. 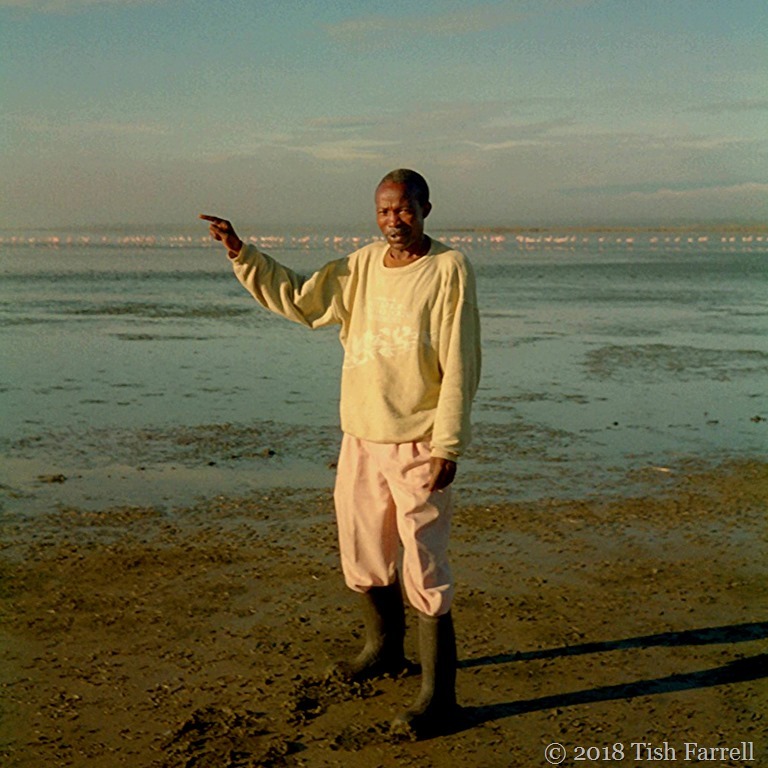 This despite some very particular sensations that still lurk in my memory – the sting of soda in nose and eyes (Elmenteita is one of the Great Rift’s soda lakes) plus the pungent whiff of flamingo guano, and under foot, the slimy droppings-rich mud along the shore. There was also the noise – the continuous honking of the birds as they jostled among rich algal pickings. On one of my dawn visits to the lake shore, I bumped into Paul Kabochi. Or rather he bumped into me. He had driven a Japanese bird enthusiast down to the lake to take photos. 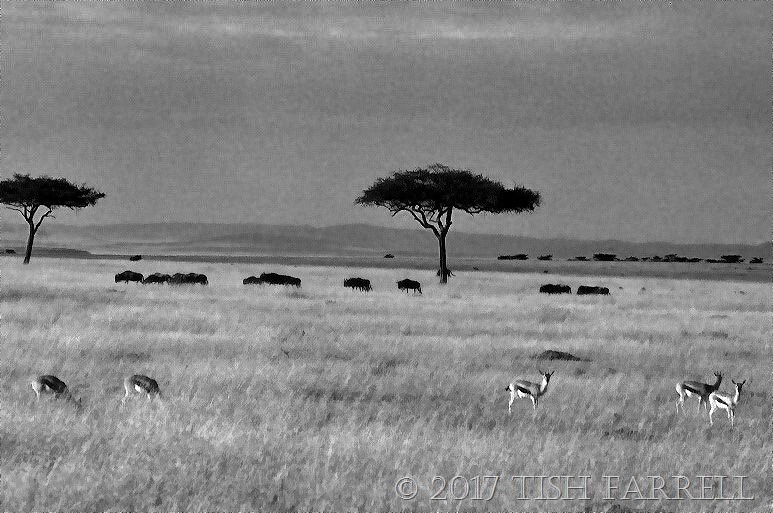 I do not think of Africa in black and white, and when we lived there during the 1990s it was still in the days of conventional photography, and only colour film was readily available. 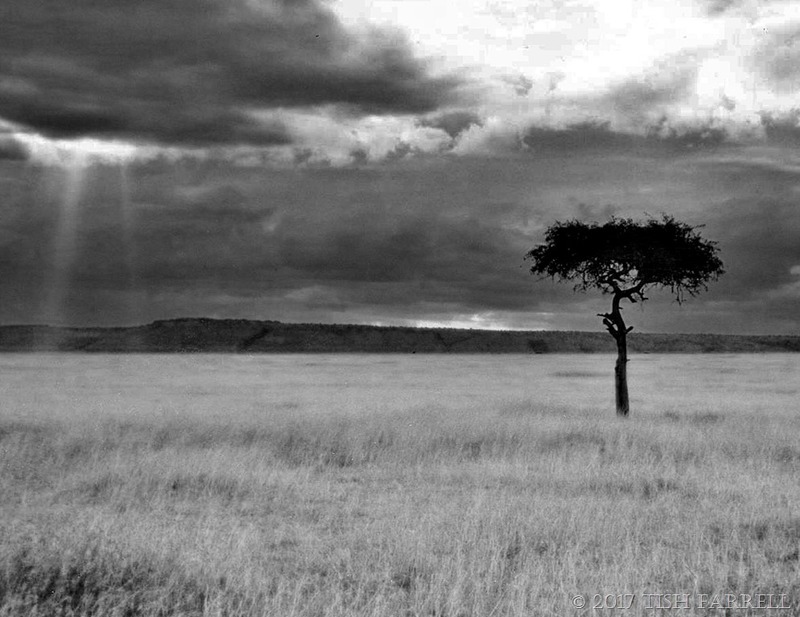 So I am rather intrigued by these monochrome edits from the old Africa photo file. They were taken in August – in the cool, dry, gloomy season, and the time of the wildebeest migration. We had driven down to the Maasai Mara from Nairobi under lowering skies, taking our visitors, Chris and Les, on safari. The roads were dusty and the bush country parched and dreary looking for mile after mile. Amongst other things, the first photo shows how empty the landscape can be of wildlife, or indeed of people. 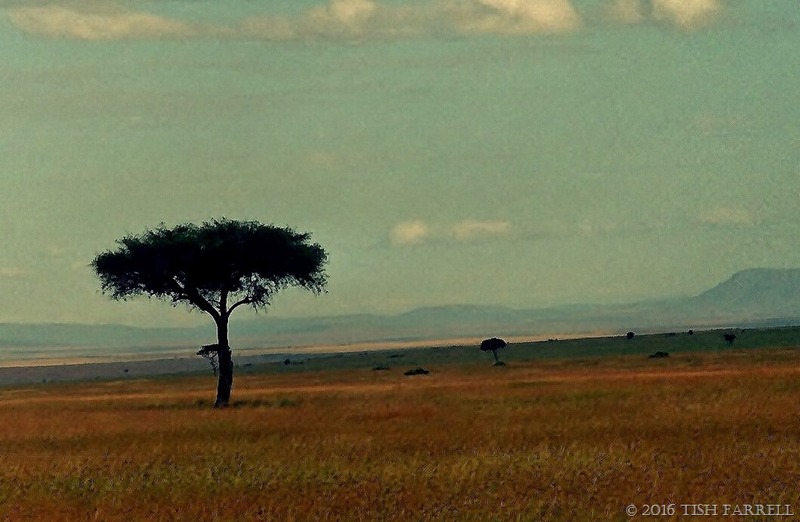 In the distance is the Oloololo Escarpment which forms the north west boundary of the Mara Triangle. The tented camp where we were staying was on the Mara River outside the park, and part of the Mara Conservancy, a reserve managed by the Maasai themselves. 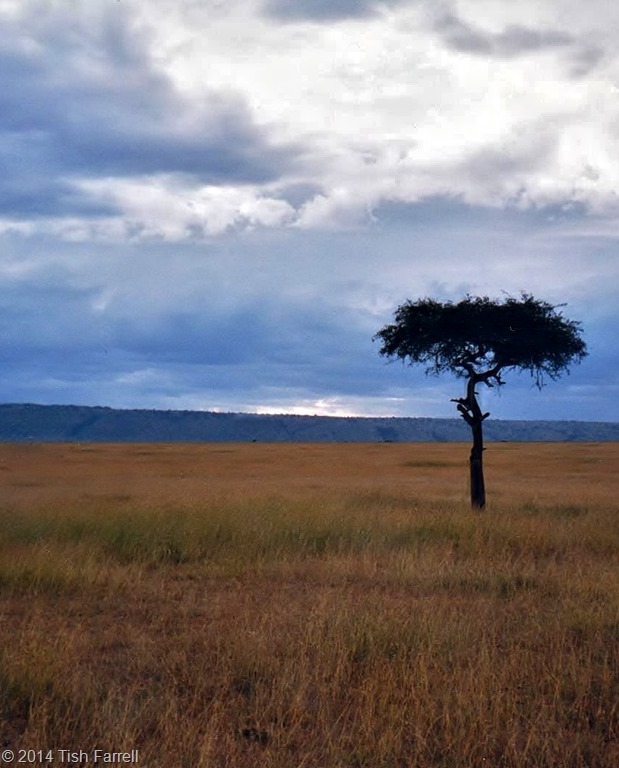 The lone tree is a Desert Date (Balanites aegyptiaca ), and is typical of the open savannah where its presence is highly valued by humans and grazing animals alike. It fruits under the driest conditions. The tree has also long provided traditional healers with remedies; like the baobab, Balanites is one of Africa’s tree pharmacies. The fruit’s outer flesh was used for treating skin diseases, and preparations of the root and bark were used to combat malaria. The oil within the fruit in fact has a host of remarkable properties. 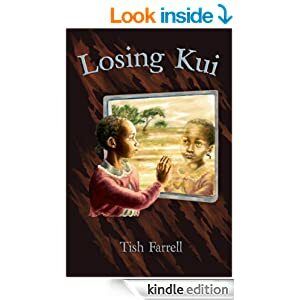 It has long been known that it kills the freshwater snails that carry bilharzia and the water fleas that are vectors of guinea-worm disease (Trees of Kenya Tim Noad and Ann Birnie). It has also been studied more recently by Egyptian scientists who reported their findings in the the 2010 Journal of Ethnopharmacology. Their laboratory tests revealed anticancer properties for certain human carcinoma cell lines, as well as demonstrating selected antimicrobial, anthelmintic, and antiviral activity. An all round useful tree then. The shape of the trees in the photos is also typical. 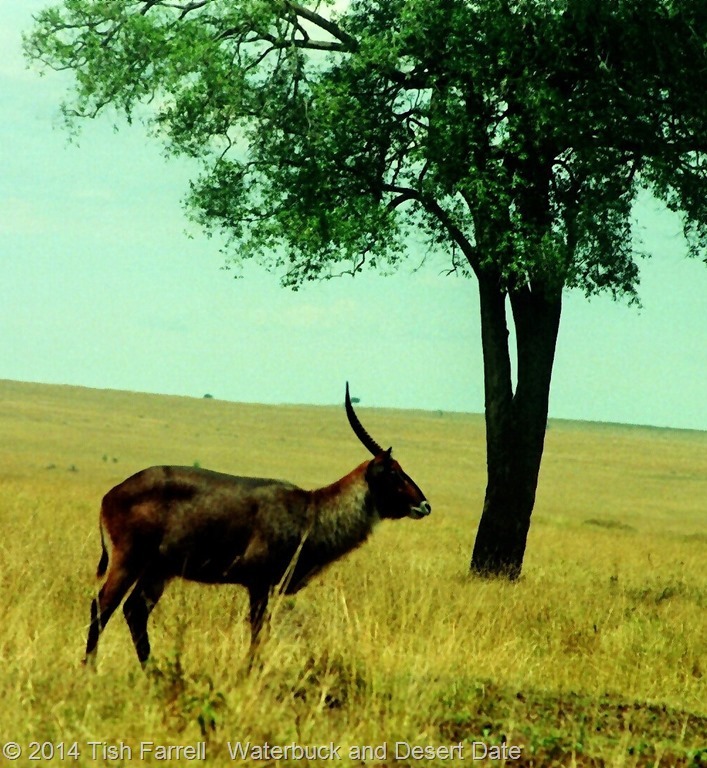 The result of having their canopies nibbled by passing giraffes, although there are none in sight here – only wildebeest and Thomson’s gazelle. 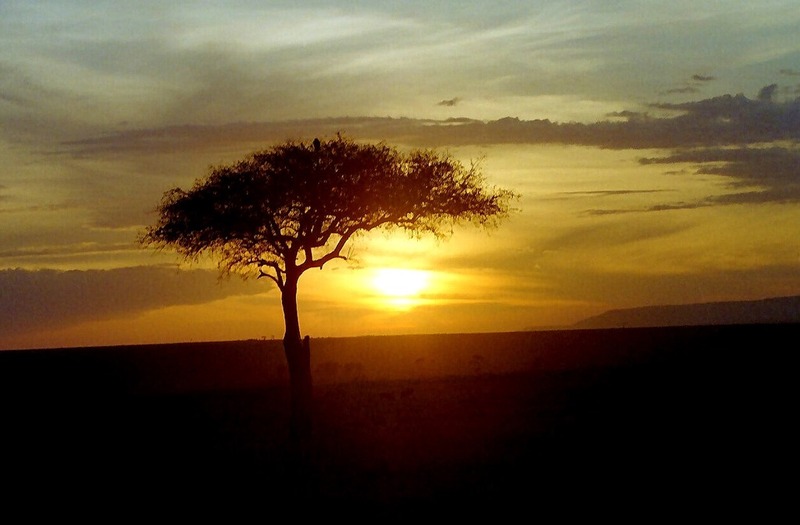 Badda, Othoo, Olokwai, Eroronyit, Mjunju, Kiwowa – are just some of the names that Kenya’s peoples use for this super-tree. 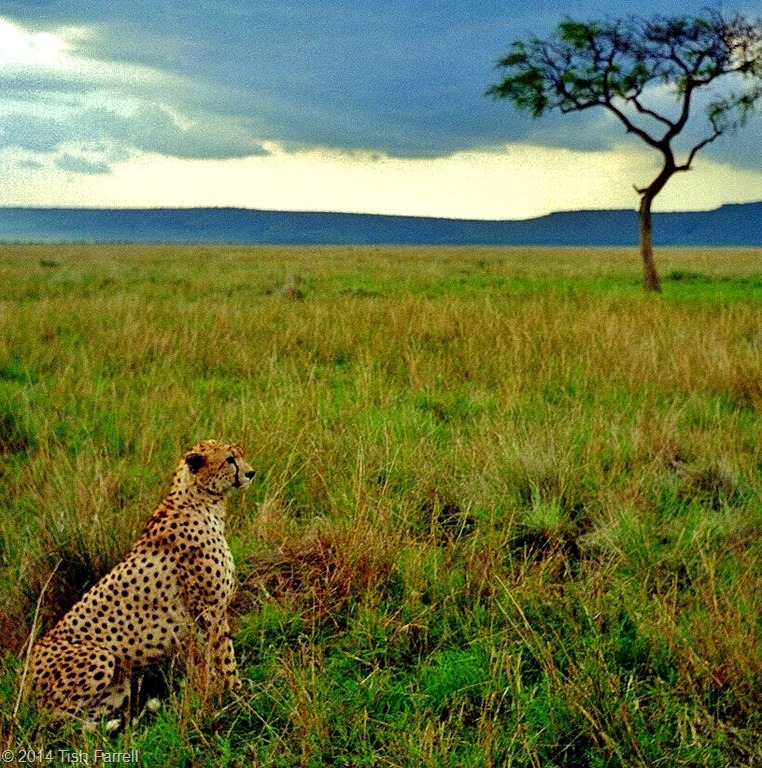 Here, in the Maasai Mara, its lone presence on the grasslands adds a sense of drama. Perhaps the spare silhouette springs some ancestral memory. For if we believe that humankind evolved in the Great Rift, then we must have an ages-old association with this tree, and not only as a source of food, but for firewood, the making of shelters and tools and, most especially, for medicine. All the photos here were taken in the Mara, but the range of the Desert Date (Balanites aegyptiaca) extends across much of Africa, and into parts of the Middle East and India. But wherever it grows, its multiple uses have long been valued. Much like the baobab, it is a natural pharmacy. Every part of this unassuming tree has been scientifically shown to be packed with pharmacologically active substances. And so it is that the practices of generations of traditional healers, from Africa to India, (and so often sneered at) may now be vindicated: all along they have been barking up precisely the right tree. For example, the Pokot pastoralists of northwest Kenya make a decoction of the root to treat malaria. They also boil the root in soup to ease oedema and stomach pains. For heartburn, the Akamba of central Kenya make an infusion of bark. Throughout East Africa, the root is used to get rid of intestinal worms, and as a general purgative. The bark is used as a fish poison, and when mixed with fruit will kill freshwater snails and copepods that host the parasites that cause Bilharzia and Guinea Worm respectively, both scourges in many parts of Africa. In Sudan herbalists use Desert Date to treat jaundice, and in West Africa the fruit is mixed into porridge and eaten by nursing mothers. The seeds, when boiled, produce an excellent oil that is used in food preparation and to soothe headaches. Over 4,ooo years ago in Ancient Egypt this oil was a prized cosmetic. So much so, that the seeds were placed in tombs beside the dead as if to suggest that, in the afterlife, this was a tree that no one could be without. In fact Balanites thus once grew in profusion along the Nile Valley, and were possibly cultivated. But they are also well adapted to arid and semi-arid conditions, tolerating both sand and heavy clay. Their vertical roots reach down 7 metres, while the horizontal roots may extend 20 metres from the trunk. It can also cope with stock and wildlife grazing (the characteristic canopy is shaped by browsing giraffes), flood, and grassfire. Their boughs and long, thin spines photosynthesize even when the leaves drop off. This makes them a valuable famine food. No matter how dry, each year they can produce up to 10,000 date-like fruits. The flesh is bitter-sweet, but eaten by humans, their stock and most wild game. 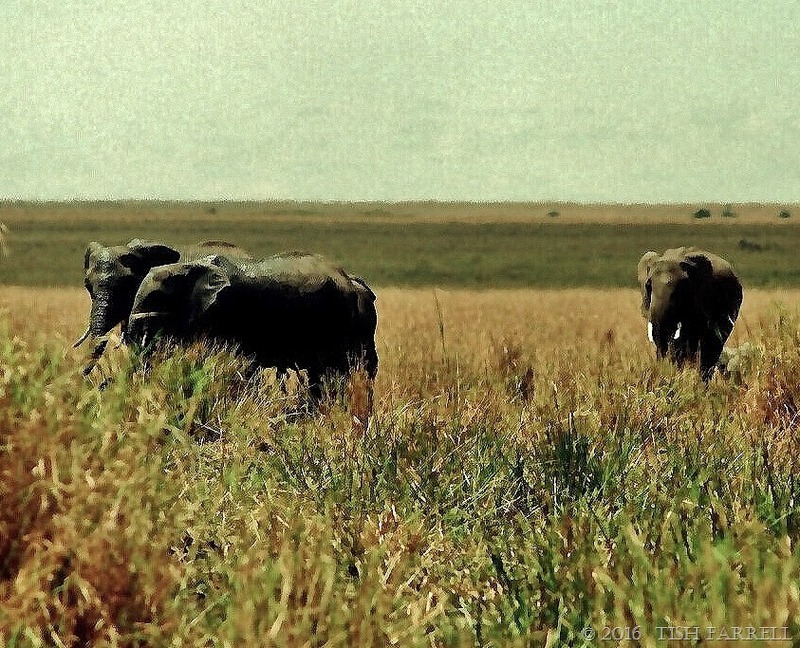 In fact elephants are one of the main propagators of this species, at least in Africa. While most other creatures spit out the stones, elephants swallow them, depositing them in due course in dollops of ready-made compost. In Kenya the Pokot and Turkana also eat the tree’s young leaves and shoots, boiled, pounded and fried with fat. 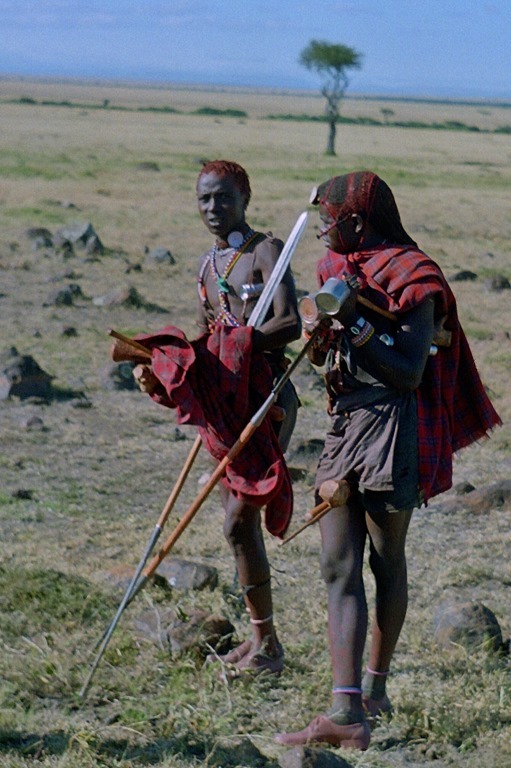 The Maasai eat the gum, and the Marakwet boil the seeds and eat them like beans. In other parts of Africa the small flowers are stirred into porridge, and the fruit is fermented to make alcoholic drinks. And then there is the wood. This is an excellent cooking fuel since it burns with little smoke. The wood is durable and used for house-building. It is also easily worked to make yokes, wooden spoons, pestles, mortars, handles, stools, combs. Resin from the tree stems is used to stick feathers on to arrow shafts and spear heads to shafts. The Turkana use it to repair cracks in tool handles. And the tree itself may be grown in farmsteads as a living fence that can be cropped for both human needs and livestock fodder. While it is protecting domestic animals and crops it is also fixing nitrogen in the soil. And now you know why I called it a tree of life. It is ripe for development too, the kind of development that can only enhance existence on the planet. In fact one gasps at how much potential can subsist within a single tree species. AND THIS IS JUST ONE TREE. But doesn’t it show, and with glaring clarity, that instead of destroying the world’s wild places (and for mostly very pointless reasons), we need to protect and learn from them, and learn, too, from those indigenous peoples who still know them intimately and understand where the real treasure lies.